Industry Conference has made a real name for itself on the conference circuit in recent years. It’s marketed as the ‘The Event for Web Professionals‘ and certainly lived up to that title. Over 1 day, web industry professionals come together to listen to 8 speakers talk about their experiences in the industry, providing valuable insights into their work with the ultimate aim of making us all that little bit better at what we do. In previous years, it has attracted speakers from the likes of Google, Yahoo & Microsoft. You can see a good collection of previous talks on the Industry Conference Vimeo page. This year was no different. Brilliant, inspiring speakers talking passionately about subjects that matter to modern day web designers, developers and business owners. The topics of talks were varied. You even get a fun goody bag which included a Moleskin from Heart Internet, lots of stickers to hide even more silver on your MacBook and a lego toy amongst other items. 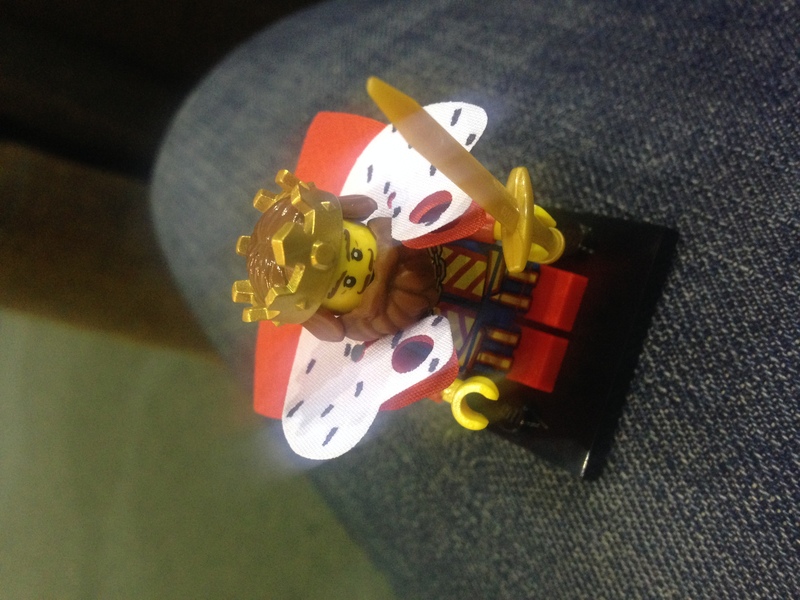 Check out my Lego King!. The pre-conference party was held at agency Campus North & gave delegates a chance to relax, talk shop with others & even dabble in a game of Beer Pong. It was only my third web conference (2nd in Newcastle) but we got a very warm greeting from organisers and other delegates alike & found the whole experience very inspiring. On the day of the event, we all made our way to the Turbine Hall, got our goodie bags and headed to the main conference area. After a brief introduction from Conference organiser, Gavin Elliott, we were off & running with Joe Leech. First up was Joe and his talk ‘Psychology and the Perfect Design’. Joe is a UX consultant and I found him to be a very enthusiastic speaker. Joe discussed how we can find that “perfect” design through a variety of methods, primarily psychology. In a previous life, Joe was a neuroscientist and clearly this has influenced his UX experiences. He explained we can all take advantage of human behaviour like instinct, and use it as part of an overall UX strategy. Joe also makes it clear that this taking advantage isn’t nearly as “grubby” as it sounds. I also like Joe a lot as I won a set of 5SimpleSteps books he gave away on Twitter! One of my favourite anecdotes was Joe telling how as a child, a gang spotted his IT smarts, cobbled together some money and bought him a computer to hack an ATM, just like the Terminator II movie they had seen. “What is beautiful is usable”. Beautiful images and/or well-written copy can both help you evoke emotion. Joe’s slides are available here: http://t.co/tJh4Mi2tem. Emma Boulton is the Research Director at Monotype. Emma’s talk ‘User Research is Everyone’s Job’ focused on User Research within a web team. I personally connected a lot with this talk. Often within agencies, the research on a project can be handled by a select few (senior designer, project managers) and not include the entire team. This misses out a lot of potentially crucial input. Everyone has a role to play in the research of a project. Emma likened user research to Lego. “It’s about piecing together insights and data into a narrative, a story” she explained. I’ve often found on projects in the past that suggestions can come from the most unlikely sources. Simply showing an unbiased friend a site I made on mobile uncovered a heap of excellent suggestions that I would not have considered beforehand. Emma discussed the varied ways to glean useful data from user research. “Semi-structured interviews are like the focus groups of the web industry. But it’s a good place to start” she explained. She also suggested to be very cautious when conducting user research so not to influence the user too much. The main take away from this was that *anyone* can be a researcher. And the more you can do, and more user research you can conduct, this will inevitably improve your overall design skillset. Monika is a Front End Development Lead at Shopify. Monika’s talk again resonated a lot with me. With the speed of evolution of our industry, it can be sometimes hard to pin down exactly what a job title means, involves, who does what, their responsibilites. Converying your day-to-day can be so much more than just what the title suggests. Monika wound up her talk by discussing a little of how Shopify does front end and in particular how it handles style guides. This was a fascinating insight and I recommend you check out her slides to have a look. And again, as Emma said in the previous talk, she embraced the idea of sharing; sharing knowledge and expertise for the benefit of everyone on the team. So everyone has a grounding in accessibility and not just those on the front end. The main take away points from this are that everyone on the Front End Development team should have shared tools like design standards, processes & style guides. For consistency. I also liked Monika’s suggestion to do talks in your team. So maybe once a week, everyone shares what they’re working on. The other team members may learn something new from this kind of interaction. Monika has kindly provided her slides from the day: http://t.co/TeiDtpBaCr. Tobias was an excellent speaker. Lots of good humour and useful technical points made. His tips and advice included things you could put into action the moment you were back at your desk. Everyone knows the bulk of the page load time is with hi-res images. There are some great tools out there to optimise your images, but Tobias gave us a lot more technical advice on how we can all reduce file sizes effectively. Performance is a key reason why users will stick with a website or leave. Tobias recommended we use webpagetest.org to best optimise our images and test. I definitely found a greater appreciation for JPEG compression since the talk. Performance is a key factor to the success of your website. One that it’s good to remind yourself during projects, especially when handling images. Tobias’s slides are available to view: https://t.co/CQ64rfVm5L. Brynn is a UX Lead for Android & her topic was ‘The Beauty of Ordinary Design’. This was one of the most interesting talks, in my opinion – and it barely touched on Brynn’s working experience with Google and Android. It was an excellent mix of wide-ranging issues she has found with ordinary life – social, political, in her environment – and the steps that she feels could be taken to improve for her and society as a whole. It’s healthy to review existing problems/processes and look for new ways to streamline your work and the work of others around you. Brynn’s slides can be seen here: http://t.co/OIH70txpuV. Sara talked of ‘Content Amid Chaos’. One of Sara’s opening lines included “Most of the websites I go to are like this: covered in garbage. I love the web. But our websites are filthy”. That’s a very accurate statement. Comparing the web to the garbage problem in her home city of Philadelphia. So much ‘stuff’ and information overload. Designers/developers can be guilty of failing to funnel the user down the path the clients want them to take. “Content always feels like a problem” resonates a lot with me. For something so core to your site’s raison d’etre, it can often be left as an afterthought with the shiny new design taking centre stage. Understandable to an extent, but users will nearly always first and foremost come to your site for the content. Sara works with many organisations and sees the problems over & over. Organisations that are not organised. And she sees this disarray manifested on the organisation’s website. She proposes organisations clear the clutter & keep the focus of content simple. At the end of the day, Sara proposes if you are in an organisation with these issues, you at least take small steps to fix bigger problems. Make a small dent and you’ll see a positive change. Sara Ann Marie has added her slides: http://t.co/SVOuOt3Nyl. Jessica Harllee is a product designer at Etsy in Brooklyn. Jessica gave us all an amazing insight into how Etsy rolls out changes across its site. Taking just a small portion of the sales process, Jessica spoke to us about how they redeveloped the Listings Manager with help from user research, analytics tracking information & face-to-face (via Skype) feedback from actual Etsy sellers. Etsy have specific ‘prototype’ groups who feedback on new UI updates which all genuinely get fed back to the web team and influences their decisions. Etsy has a strong brand and engaged community, seemingly very keen to help in the design/build process where possible. Naturally, an improvement to any part of the Etsy system will hopefully lead to greater sales for the customers. The amount of effort applied to user research/input was very refreshing. After all that’s what should govern a large part of the direction of any website. Jessica has even taken the time to publish an article on the subject of her talk here: http://etsydesign.com/news/improving-our-seller-onboarding/. I’m fairly novice to Type, but Rob did a great job explaining the history and how it has evolved from print to web. I left Industry Conference with a renewed sense of enthusiasm that I hoped to pour into my work in the future. I hope you found this summary of Industry Conference 2015 useful. What did you enjoy about it, did it change your thinking or way of working? Drop us an email – we’d love to hear from you!